That’s how Fox News’ Lauren Green began her challenge to Reza Aslan’s right to write about Jesus. The video of her interview with him instantly went viral (in fact, several accidental theologists sent it on to me — thank you!). It inspired several spoofs, including this one here. Aslan’s book, Zealot (my San Francisco Chronicle review of it here) was already #2 on the Amazon bestseller list; by the next morning, it was #1. “Gotcha, J. K. Rowling!” Aslan responded. But aside from the small detail that Christianity was founded by Paul, not Jesus, Green’s question may not be such a terrible one after all. It quickly became clear that this was not a sufficient answer, and that the question was not about my decision as a writer. It was about my decision as a Jew. Just as Green focused on Aslan’s Muslimness and assumed that his real agenda was to attack Christianity, so certain conservative Muslims focused on my Jewishness and assumed that my real agenda must have been to attack Islam. Let’s get one thing straight right away: just as many mainstream Christians have welcomed Aslan’s book, so many mainstream Muslims have welcomed mine. It’s the conservatives we’re talking about here, those who cannot tolerate any deviance from received orthodoxy. In the context of Fox’s Islamophobic politics on the one hand, and of the Israel-Palestine conflict on the other, perhaps such suspicion is inevitable. But since Aslan’s book and mine both draw on scholarly resources but were written for general audiences, there’s another less obvious factor. Most devout believers are unaware of the vast body of academic research on the early history of Christianity and Islam. Used to hagiographic or devotional literature, they see any more dispassionate view of their revered figures as an assault on their belief. Demanding perfection, they refuse to tolerate human imperfection. But what if Green had interviewed Aslan not with the desire to criticize, but with the desire to know? What if my conservative Muslim questioners had been more curious than judgmental? Without such knee-jerk defensiveness, the question of what a non-Christian brings to the study of Jesus or a non-Muslim to that of Muhammad becomes an interesting one – a question, that is, about the value of the ‘outsider’ point of view. Precisely because he or she does not come from a place of belief, what seems obvious to the insider is not at all so to the outsider. It demands to be explored, to be understood on the multiple psychological, cultural, and political levels on which history takes place. Done well, this process can create important new insights into otherwise received versions of history, opening up fresh ways of seeing and understanding, and finding new relevance in old stories. As with Jesus, so with Muhammad: by placing him in the world he experienced, in the full context of place and time, politics and culture – the ‘outsider’ biographer honors the man by honoring his lived experience. Historical reality doesn’t detract from faith; it humanizes it. And when gross inhumanities are committed every day in the name of one faith or another, that alone should surely be more than enough reason to write. The relevant term here is “fencing the Communion.” You know the little fence at the front of the church where you lean your elbows while waiting for the Elements to reach you? (Maybe not — ask a Catholic.) There was a huge early battle about who had to stay outside that railing and who was entitled to enter. Territoriality. Tribal. Strongest when the group is uneasy about its identity and afraid of dilution by outsiders. (Check the Mexican border. Heck, even the Canadian border.) Writing about American Indians without BEING American Indian is a mortal crime because it becomes harder and harder to define an American Indian. Great comment: territoriality is exactly the right word. Yes, Lesley you are SO right on here! And even if you’re a former believer, believers still automatically assume that a writer is out to, at best, criticize, at worst, completely demolish all they hold dear. People become so defensive that they can’t see that what a writer might really want to do is to explore, to understand, to express….. Most devout believers are unaware of the vast body of academic research on the early history of Christianity and Islam. Used to hagiographic or devotional literature, they see any more dispassionate view of their revered figures as an assault on their belief. Demanding perfection, they refuse to tolerate human imperfection. 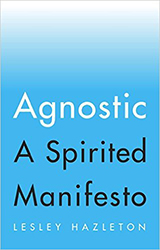 The advantage of a writer who doesn’t share the ideas/beliefs of the subject, in your case a prophet whose life was centered exactly on those ideas/beliefs, is a much-needed unbiased perspective of what that man did. The disadvantage could be not understanding the subject himself and missing out on the essence of why he did what he did. True, but understanding is on whose terms? Part of what I mean by “an agnostic eye” (in the banner of this blog) is an independent one. I agree with you as a devout Muslim. In many verses in Quran Allah wants human-beings to contemplate but human- beings are afraid to contemplate about their faith. Or they are lazy or they simply doesn’t care about religion. They are culturally Jew , Christian or Muslim. They prefer to follow their forefathers religion not their own. When they pickup Revised addition of Bible how come they don’t ask this question: who has a right to revise God’s word? They are def, they are blind and impaired to think. My ten year old daughter was asking me about popular Belief about Jesus being son of God or being God. She asked me: don’t Christians think that Jesus died 2000 years ago if God died 2000 years ago who is running universe?and If Jesus couldn’t save himself how he is going to save them ? Or don’t they think how come eternal God dies? Bible says God is one! Why they made him 3? She is also asking about Islam and She is developing her faith. Contemplating is the key. Who doesn’t contemplate doesn’t have real faith they copy others faith. I don’t think Aslan was writing as a “Muslim”—though it may have effected his perspective. I havn’t read the book but from watching various interviews, Aslan, apparently, puts the illiterate Jewish carpenter from Nazareth into a historical context/time-period. However,the picture of Jesus (pbuh) in the Quran is a Jewish man who is intelligent, literate, a good communicator, exceptionally skilled, and highly spiritual. 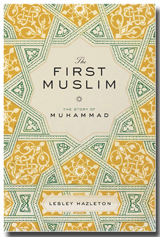 I’ve just placed the order of your book, The First Muslim in India, it was very expensive, however, they have now priced it correctly. This shall be my third biography on Prophet Muhammad, peace and blessings be on him, which I’m going two read. 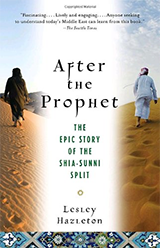 The other two by Karen Armstrong and Safiur Rehman Mubarakpuri. Thank you, Farrukh. 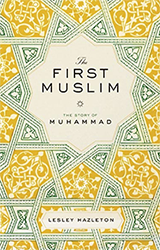 And re The First Muslim, the UK edition is due out November 7. Since India is part of the ‘UK and Commonwealth’ distribution system, it should then be easily available in bookstores.